This is a short piece not originally intended for this blog, but relevant enough to publish it here anyway. This is a radical departure from the Christian tradition of prayer as it had grown to exist. The critique that the 7 hours were abused and not in fact said as they were intended to be said in medieval times is no argument for their abolishment, but an argument for their proper and intended use! The Prayer Book (BCP) Offices are very basic and bare without obvious scriptural grounding and practice. It is often said that The Book of Common Prayer (BCP) conflates the Offices of Matins, Lauds and Prime into Morning Prayer, and Vespers and Compline into Evening Prayer. It is closer the truth to say that the BCP Office consists elements taken from the traditional sevenfold Breviary Office so that in Morning Prayer the hours of Matins, Lauds, and Prime are represented by elements taken from them. And that Evening Prayer consists of elements taken from Vespers and Compline so that they are represented in Evening Prayer as it were. The BCP does not function the same way that the traditional sevenfold Office does. The BCP Office was intended to be a vehicle for the public reading (and hearing) of Scripture. Though this is undoubtedly the result of Abp. Thomas Cranmer’s protestantism, there is nothing uncatholic about reading Scripture as part of the Divine Office as such. The uncatholic nature of Cranmer’s version of the Divine Office is, paradoxically, his removal of the Divine Office from its scriptural grounding and context. The first coming of the Lord which occurred in the Incarnation. The second coming of the Lord which will occur at some future time known to God alone. At Matins bound, at Prime reviled, condemned to death at Terce; nailed to the Cross at Sext; at None his blessed side they pierce; they take him down at Vesper-tide, in grave at Compline lay; who henceforth bids His Church observe these seven hours alway. The worshiper keeping these hours according to day and season is making a deliberate act to unite the entirety of life to the Lord Jesus Christ by interpreting and practicing Scripture. By dropping the hours of Terce, Sext, and None all-together (they are not even represented in Morning and Evening Prayer) and by radically restructuring Matins, Lauds, Prime, Vespers and Compline into Morning and Evening Prayer the scriptural conception (Ps. 119, 164) and practice (each hour connected to an aspect of the Lord’s redemptive suffering) are torn apart and are lost to the Christian. This does not, of course, doom us as Christians to the pit of darkness, but it does diminish the way that our lives were previously mapped onto the Scripture and the life and redemptive acts of our Lord Jesus Christ. Instead we get two hours of prayer which serve primarily as a vehicle to immerse the worshiper in Scripture without providing means to interpret and practice it as was (supposed) to be done before. Mere immersion in Scripture does not suffice, it needs to be interpreted and practiced if Scripture is to be the food which grows and sustains Christian maturity in Christ. There are several attempts by Catholic Anglicans to restore the Divine Office to traditional health, such as was also done for the Mass as in the several Missals produced by the Anglo Catholic Movement. One such attempt is represented by The English Office Book which keeps the Cranmerian structure of the Divine Office but adds Antiphons, Hymns, Collects, short versicles, and significantly expands the sanctoral cycle which was almost entirely removed by Abp. Cranmer in the first and second BCP’s. When this is used in combination with the various diurnals or little hours books produced by the Catholic revival of Anglicanism this might be a very elegant way of fixing one of the problems with the Prayer Book. Another way of going about fixing this problem is to retain all the Prayer Book propers (Epistles, Gospels, Collects) but to restore the sevenfold Office around it as it were. This has been accomplished in the Monastic Diurnal & Monastic Breviary Matins and the Anglican Breviary. These attempts at restoration fully reintegrate the Divine Office into the scriptural structure as it was (officially) in use in medieval times. Practical considerations may, however, favor the English Office option above. The English Office is even more attractive as an option when it is used with the 1922 Revised Lectionary which qualifies the Office as a vehicle for Scripture reading by deliberately tying it to the Church Year. There are ups and downs to both the Breviary and English Office options and neither are perfect. 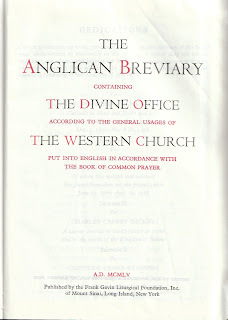 The Breviary for example is too low on a daily diet of Scripture reading, whereas the English Office suffers from the Protestantism of Thomas Cranmer (in that it this Office is divorced from older and more traditional ways of prayer). A mere return to medieval times is, however, undesirable in that the 7 hours were aggregated so that they were not in fact said at intervals throughout the day at all. This is an abuse. Some justification could be found to aggregate Matins-Lauds and Prime into one block, but the other hours ought to be said as close to their proper times as possible. If such is not possible the English Office is a good alternative. Especially in parishes it may be difficult to keep the sevenfold Office where only one priest is available for all the priestly functions – even more difficult is the situation where a priest has to be bi-vocational. In such situations the sevenfold Office cannot be kept and the two-fold Office, retaining its seasonal and sanctoral cycle features, seems to be the best alternative. This entry was posted in Anglican Breviary, Book of Common Prayer, Psalmody. Bookmark the permalink. I agree with your assessment because I have been encourage by my mentor, Father Jenkins to do more of the BCP, morning and evening prayer as part of the commitment to the diaconate. As a user of the AB I already miss the majesty of the divine office but, time constraints make using them both difficult to manage. Then one needs time for “lectio” also. I really believe that we as Catholic Anglicans need to face the music of the Reformation and realize that more than the Mass got mutilated in the Reformation and that something needs to be done to regain the Office as well as the Mass. It is my practice to add the readings from the 1922 Lectionary to the devotions before the Office (two bfr Matins, and two bfr Vespers or Compline). You point out one of the issues that makes the LOTH unsuitable for me as an alternative. Prime has vanished, of course. But the structure is awkward for one wanting to pray Terce, Sext and None. Arranging the Psalms for those three hours rather than just praying one is difficult. The AB lays it all out there! It is not our medieval predecessors who naively failed to understand Scripture, it is us arrogant moderns who are too blinded to “spiritually discern.” I think “Medieval Exegesis,” or at least “The Heavenly Tapestry” ought to be mandatory reading for confirmation classes! I also think that some writings from the Radical Orthodoxy authors (Pickstock and Milbank in particular) ought to be more widely read. “Truth in Aquinas” is a tough read but immensely rewarding. Most days, that works well for me. In particular, committing to Terce, Sext, and None at their appointed times just isn’t going to happen. Meetings, phone calls, losing track of the time, etc. condemns one against the traditional schedule. In addition, the anticipation of Matins and Lauds is an absolute necessity for me. There is no way that I could fit in Matins, Lauds, AND Prime before I’m out the door. I do tend to do this on Sundays, before my 11AM Mass. But on weekdays and Saturday small business days? Forget about it. Most of the time this isn’t too bad, but I do sometimes have to close one eye when I run across light imagery in the Lauds hymn. I also think yours is a case where the English Office Book might be a decent alternative. It is not hard to add patristic readings or legends to the English Office Book. It is much less time-consuming. I pray all of the day hours in Latin using the 1962 Roman Breviary (with the Vulgate psalms). I use the AB for Matins/Lauds as the 1962 RB made a hash of the patristic readings and the Lives in the nocturns. Also, I usually pray Matins/Lauds somewhere between 1 and 3 AM depending on the call of nature, as it were. The nocturns in the AB are delightful and edifying, and at 3 AM the English is more accessible anyway. I then go back to sleep, and when I get up again at 5.30 I pray Prime; I can usually fit the little hours in during my work day, often doing 2 of the 3 together, and fitting a 5 minute examen in there to make sure I’ve not gone off the rails in my dealings with others at work. If I don’t pray Vespers at work before going home it usually doesn’t happen until everyone’s homework is done, etc. Some nights Compline gets attached to Vespers, which means I do a really poor nighttime examen, which is too bad, as to my mind the evening examen is the most important prayer of the day… my Jesuit training. If I don’t get to Mass on a given day then I feel like I don’t read/hear enough of the NT. I will often read the day’s Gospel out of a missal, but it isn’t the same measured method of reading completely through each Gospel that one gets from the prayerbook. So I miss that. When I started praying with the breviary I thought it would eat up my whole spiritual life; but amazingly, the discipline has increased rather than diminished my mental prayer. I now easily seem to find 15 minutes twice a day for mental prayer, which used to be difficult. I’m also much more regular with 10-15 minutes of spiritual reading each day. The spiritual adage that a disciplined ordered life multiplies time is really true. Of course, I never get to watch 11 back to back episodes of Hogan’s Heroes anymore. PS– Give my best to Father Kennedy.